The Sportsman Casino is located in the West End of London - easy to find and easy to love. The easiest way to get there is to take the tube and get off at the Marble Arch stop - less than a minute from the casino entrance. 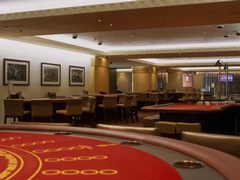 Owned and operated by LCI, London Club International - this casino classes itself as "World Class" and in a way we might be inclined to agree with them. The classy decor is accompanied by just as classy customers - remember to check the dress code before you go - along with a wide range of games and nice dining facilities. Despite the more exclusive approach offered by the Sportsman you do not need to be a member in order to gamble. Keep in mind that for wagers over £1500 you will need to show proof of identification. The Sportsman Casino combines a great gambling experience with food and drinks to make for one of the most appreciated gambling venues in all of London. London casinos are famous for offering a wide variety of games and this one is no different. The Sportsman boasts some of the most traditional casino games such as American Roulette, Three Card Poker, BlackJack and Punto Banco. But the fun does not stop there - with games such as Pai Gow it adds an extra dimension to an already packed gambling floor. For gamblers looking for more modern takes of games there is no need to worry. The Electronic Roulette tables are extremely popular at The Sportsman so hurry up and grab a seat early. If you are a slots person like me then you will be very pleased with the extensive range of slot machines flanking the tables on the gambling floor. One thing that we do miss at this premiere London casino is Poker. This is the only real letdown of the casino in terms of what it can offer to the gambler. The award-winning chef Mahmud Zaman was put in charge of creating a dining experience that goes above and beyond what diners are used to in London casinos. He did not just do that - Zaman created a restaurant which offers some excellent culinary experiences for a fairly reasonable price. The Zaman restaurant offers a menu inspired by the regional European and Middle Eastern cuisine. Food is served from 18:00 all the way to 01:00 with last orders taken just before midnight. The Sportsman Casino offers two bars for the thirsty gambler. The restaurant bar is located next to the dining facilities and offers lighter snacks along with good variety of drinks. Alongside this you will also find a few sporting events being shown on TV's in this bar. Located next to the gambling floor we find the casino bar - the perfect place to warm up before you gamble or to wind down after a successful night. Both bars offer a wide range of cocktails, beers, wines and spirits. The restaurant bar and the casino bar serve drinks from noon until 05:00. Most of the London casinos puts and emphasis on events and promotions, rather than tournaments. The Sportsman Casino is not an exception - especially because it caters to a slightly more upper class crowd. Almost every event or promotion is tied in to being a member at the casino. Signing up does not cost you a thing but some of the events - such as the VIP Slots Party - require an invite after a certain amount of gambling. One of the ongoing promotions is the Bonus Boxes - a bonus which is activated when members play slot games. However, if you do not have your membership card on you when it is activated you could lose out on a potential £250. It might seem petty to say that we want some more tournaments - especially since the casino does not offer a dedicated Poker section. But these days a lot of London casinos throw in a monthly tournament or two in order to keep gamblers happy. So if we can ask for one thing from the Sportsman Casino it would be a couple of tournaments. Pretty please. Good games, Good food, Good drinks, Good Service. The Sportsman Casino checks all of these four items and then some. It offers a gambling experience that is hard to find in many other London casino locations. Combine this with its actual geographic location, in the West End, and you will have a casino that is easy to reach as well. We really love the restaurant and bar section of this casino - as they complement the overall gambling experience brilliantly. Make sure that you sign up to the membership programme if you are planning on ever returning to the casino as it will give you access to a whole bunch of promotions, events and perks when you gamble. All in all The Sportsman Casino keeps fighting right at the top of the London casinos - offering a little bit of everything without going over the top.